Dream. Dress. Play. 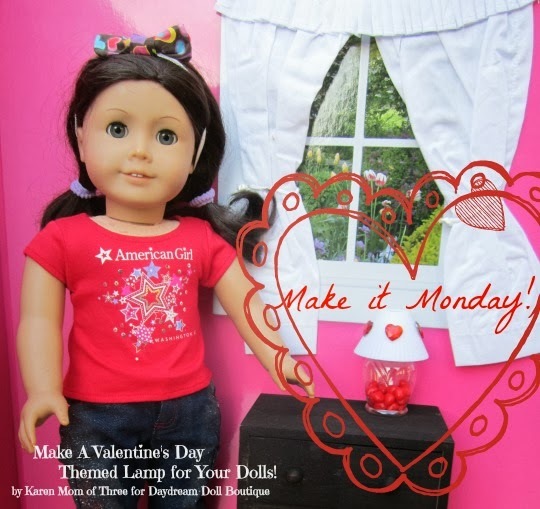 : Make It Monday~ Make A Valentine's Day Themed Lamp For Your Dolls! 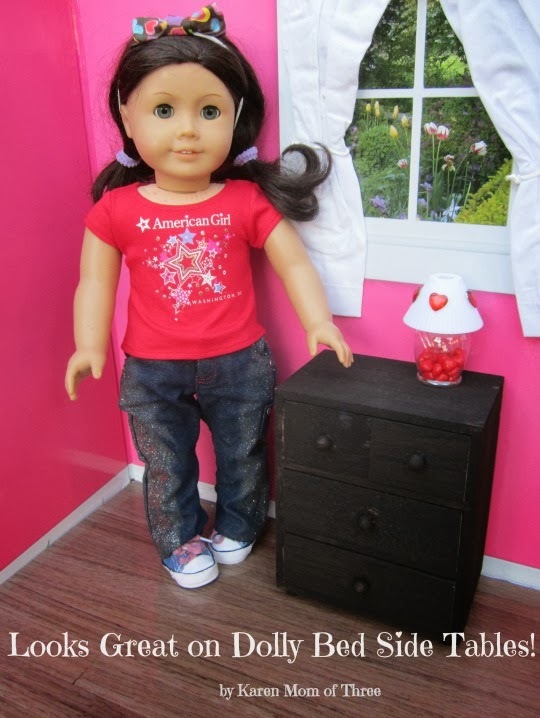 Make It Monday~ Make A Valentine's Day Themed Lamp For Your Dolls! 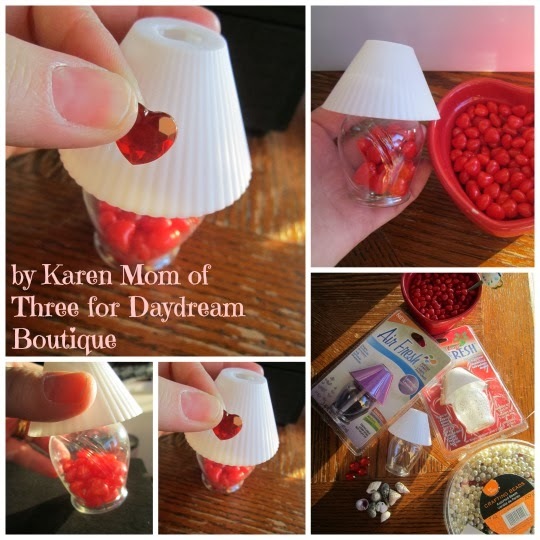 Karen here and today I am sharing a fun craft you can make for Valentines Day or for Every day for your dolls. This dollar store craft is one I think you will enjoy! Step 1-Assemble all your supplies. Ask an adult to help you unscrew the lamp shade from the lamp base and remove the air freshener stick and dump the contents of the lamp, and have them dispose of it properly. Step 2- Wash out your lamp base, use warm soapy water. The liquid inside the lamp base is a bit oily so washing it out will ensure that the color doesn't run on anything you put in the plastic lamp base. Step 3- Once the lamp base is dry, choose what you would like to be in your lamp base. The best part is you can change it with each season and to fit the decor of your doll house. * If you are using candies it is not recommended that you eat the candy once your display is finished. 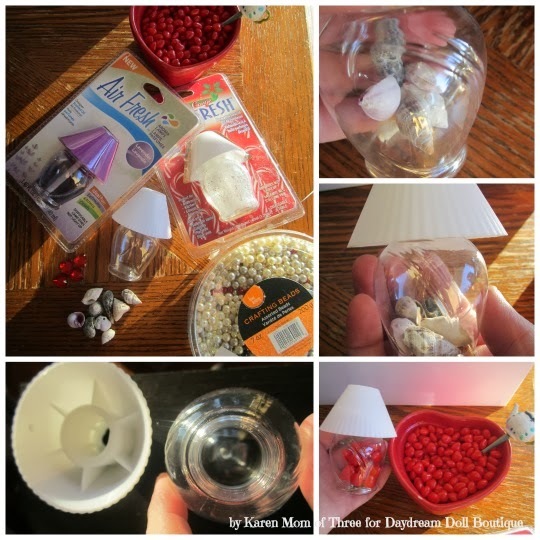 Step 4- Fill the lamp with small shells, beads or candy and twist the lamp shade back in place. Step 5- To decorate the lamp shade you will need a glue gun or glue dots to attach gem stickers or plastic gem stones, you may wish to add bows or stickers it is up to you!